Leafy green plant with ovaloid leaves that have toothed edges growing in groups of two and four up and down a woody stalk. They are prevalent in the Pacific Northwest but are also found in the southwest states of the U.S., northern Canada, and in arid parts of Asia. They are great in soups, sauces, juices and teas. Or steam them and sautee them with lemon and nutmeg. Nettles are hardy perennials with spoon-shaped green leaves. They are more commonly known for the stinging welts they leave on the skin once touched. These plants have sacs that hold toxins that contain a variety of chemicals including histamine, serotonin, and formic acid, the compound used by bees and ants for venom. Choosing: Look for light green plants that have not grown too high (less than a couple feet), also avoid nettles with leaves that have a lot of holes from insects. Buying: Sometimes available at farmers markets. Procuring: Harvest young nettle tips in the spring wearing thick gloves and long-sleeved shirts being careful to avoid touching the stems with bare skin or you will get stung. Can be used as a substitute for spinach. Saute with garlic, add to soups and pastas. Many people use nettles to make teas, wine, and even hair tonics. Cleaning: Wash leaves in cold water and then blanch in boiling water until wilted, this disables the stingers and breaks down the venom. 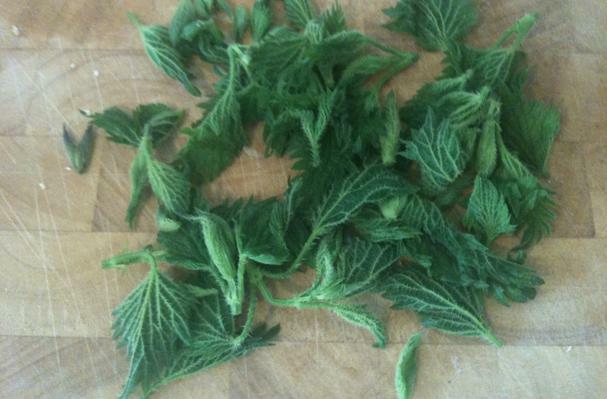 After blanching, nettles can be frozen for several months and hold up quite well. They do not wilt or break down as much as spinach and many other greens, but rather keep their body and remain almost meaty after cooking. Widely considered a noxious weed and a nuisance because of their stinging properties and prolific growth, they tend to thrive in ditches near roads and in gardens anywhere there's abundant water. History: Stinging nettle have been used for hundreds of years to treat painful muscles and joints, eczema, arthritis, gout, and anemia. Today, many people use it to treat urinary problems during the early stages of an enlarged prostate (called benign prostatic hyperplasia or BPH), for urinary tract infections, for hay fever (allergic rhinitis), or in compresses or creams for treating joint pain, sprains and strains, tendonitis, and insect bites.